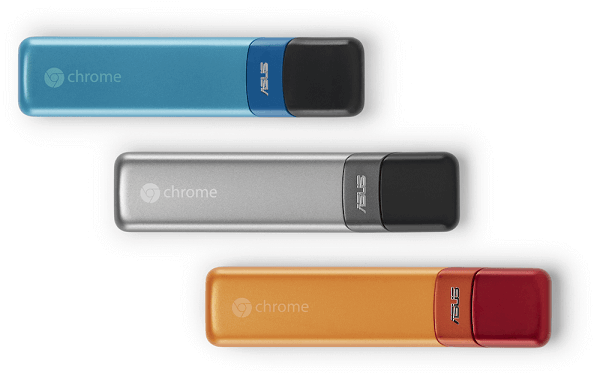 Today Asus and Google announced that the all new Asus Chromebit is now available for purchase from a wide range or retailers around the globe. It is the fulfillment of a product that the companies announced back in March. You can now pick one up for $85. But what is it exactly? The Chromebit is a Chrome OS computer that is roughly the size of your favorite granola bar that plugs into an HDMI port on any monitor or television. Plug it in and bada-bing, you have a Chrome OS computer. It is powered by the Rockchip ARM processor, has 2GB or RAM and 16GB of storage built in plus it has a USB 2.0 port, 802.11ac Wi-Fi and Bluetooth 4.0. No it is not going to set any land speed records when it comes to processing power but given that it is running a full version of Chrome OS, you can do just about anything on the Chromebit that you can do on a Chromebook. television. The Bluetooth is enabled by default so once you power it up, it will immediately begin looking for keyboards, mice, etc. Setup is a matter of minutes and once you are logged into your Google account, you can access your Google Drive, Google Docs and any other apps that run on Chrome OS from the device. Right now you can get a Chromebit from a range of retailers online including Frys, NewEgg and Amazon. Interestingly it is not a Best Buy who often carriers Chrome OS products. So do you need a Chromebit? Chances are if you are running a Windows PC or Chromebook, no. But if you want to provide a computing experience for say your college bound kids or family who don’t want to bother with a desk-bound PC, this is certainly a good alternative.